This series of Veggie Tale Level One I Can Read books at are sure to become favorites of young emergent readers and their parents and teachers. Using the beloved characters of Bob and Larry as well as their other Veggie friends, young readers will learn strong morals and values as well as be charmed by the humor and accessibility of the I Can Read brand.Junior plays the tuba. But when friends and family encourage him to compete in the Battle of the Bands, he says, No! Junior does not have the self-confidence he needs to play in front on people. Will Junior grow in the confidence he needs to help his friends and play in the Battle of the Bands? 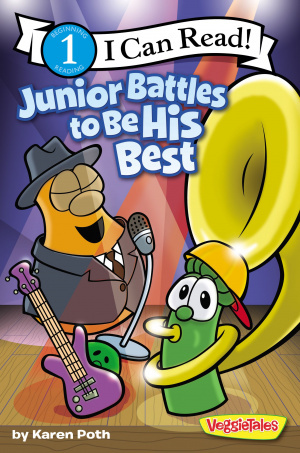 Junior Battles To Be His Best by Karen Poth was published by Zondervan in August 2011 and is our 69891st best seller. The ISBN for Junior Battles To Be His Best is 9780310727323. Be the first to review Junior Battles To Be His Best! Got a question? No problem! Just click here to ask us about Junior Battles To Be His Best.